Our hiking buddies Dave and Brenda Eissenstat met us in Newark for an overnight that included walking the towpath and transiting some locks! 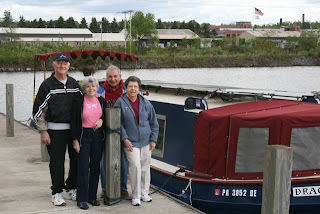 The Captain's aunt and uncle, Ken and Rose Carlsen, visited us in Scotia (near Schenectady). 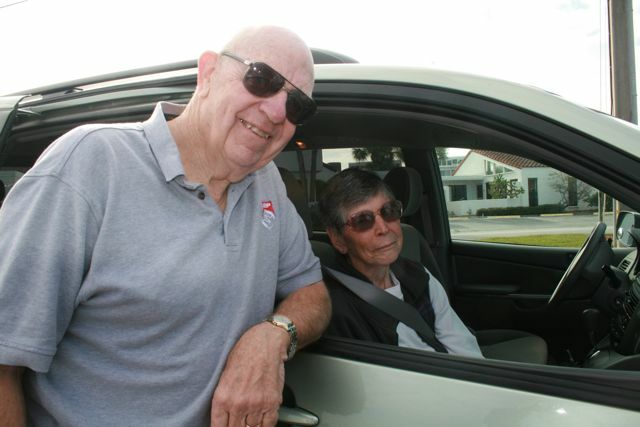 They just celebrated their 50th wedding anniversary . . . still two kids in love! 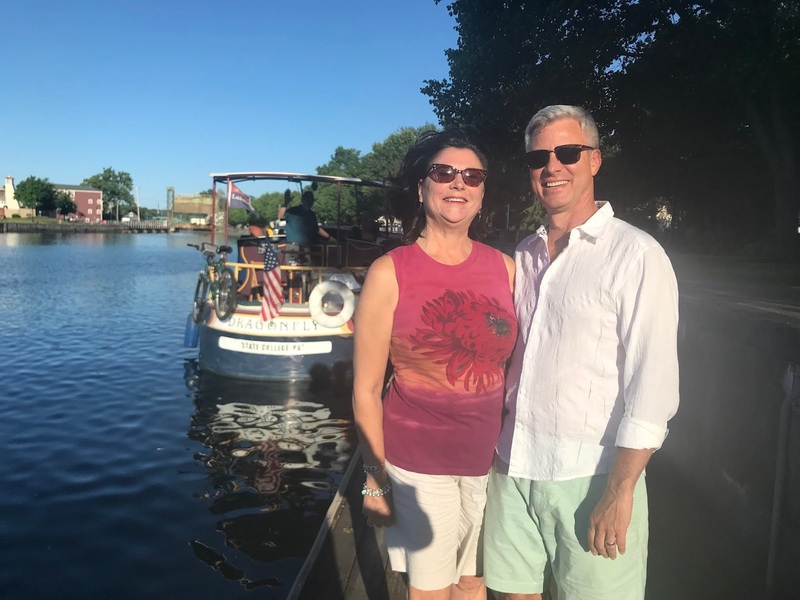 Bill's cousin Tom McKay and his adorable children Cameron, Elaina, and Colin visited us in Schuylerville, NY, for dinner on the boat and a swim in the Hudson River! 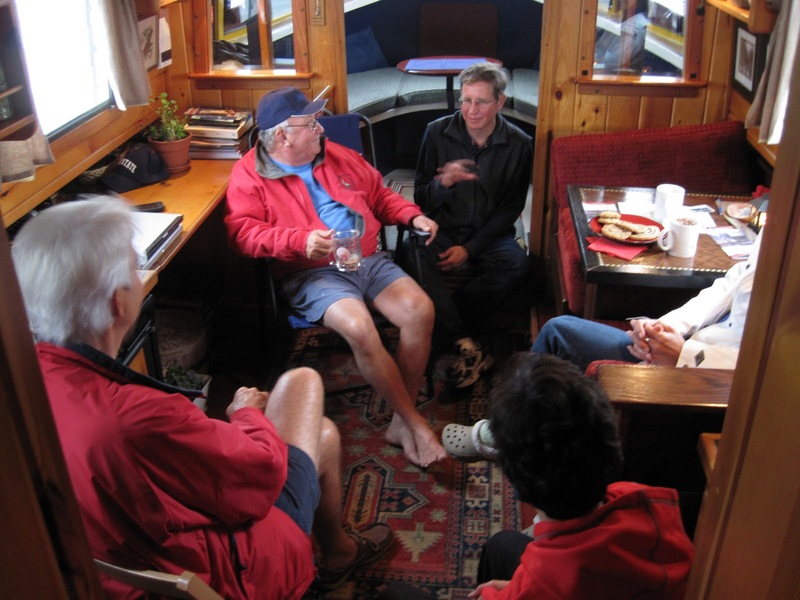 We wrapped up our cruise down Lake Champlain with a visit from Nancy Cohen, CB's longtime public radio friend. We boated from Port Henry to just below Fort Ticonderoga and enjoyed a cool splash on a hot day. More pix here. In Westport, NY we were joined by Scott and Jan Berger (the first mate's brother and sister-in-law), and their friends Scott and Helene Dubin. We had a fun day cruise enjoying the mountain scenery! 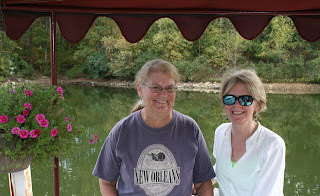 Cap's sister Susan Thomas and Mom Ann Carlsen ( left) joined us in Baldwinsville, NY, for a sunset cruise around the harbor followed by dinner at the famous Baldwinsville diner. 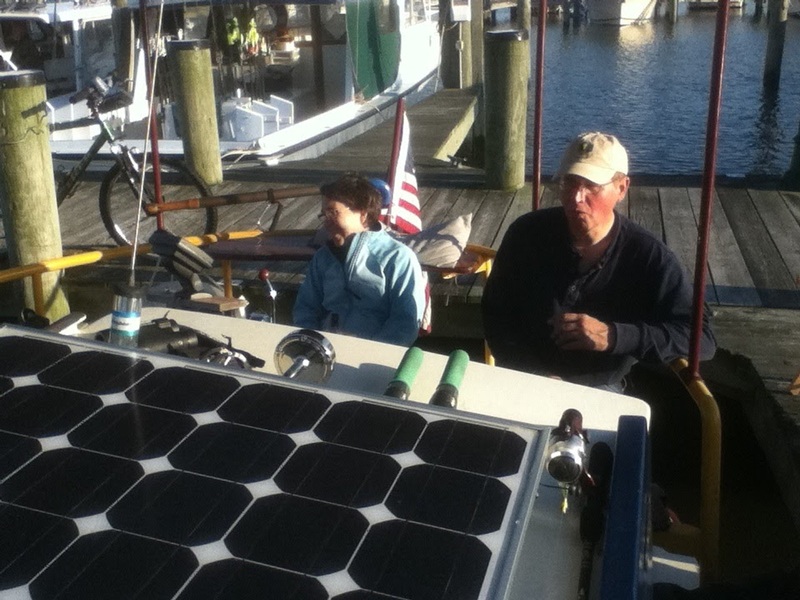 Also joining us for the mini-cruise: Michelle and Jim Keib (below). Cap and Michelle attended Tully High School together! June 13, 2011 Carolyn Pendergast Fairbanks and her husband Greg gave us a tour of Phoenix, NY, where in the late 1800s, Bill's ancestor Stephen Pendergast had a prosperous farm and raised world-famous champion trotting horses! A power breakfast on the boat with new friends Bill and Lynn Hering and Frederick and Sheila Dryer. Cap has a laugh with science writer Elia Ben-Ari. 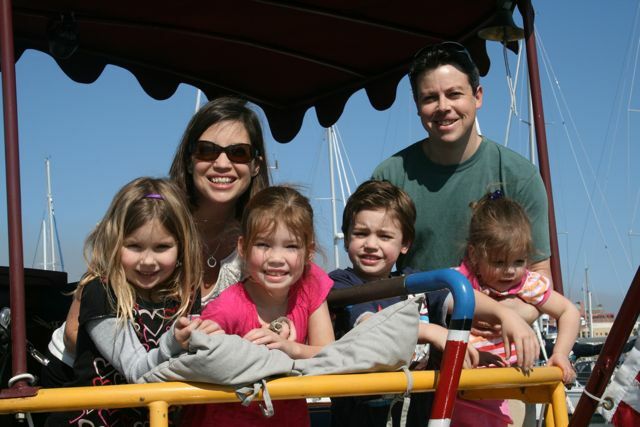 Elia and her family visited the boat in Chesapeake Beach. 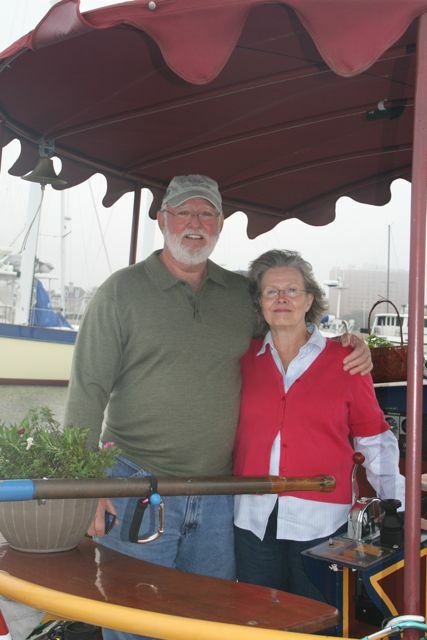 Canal enthusiasts and conservators Bill and Nancy Trout came aboard in Elizabeth City. 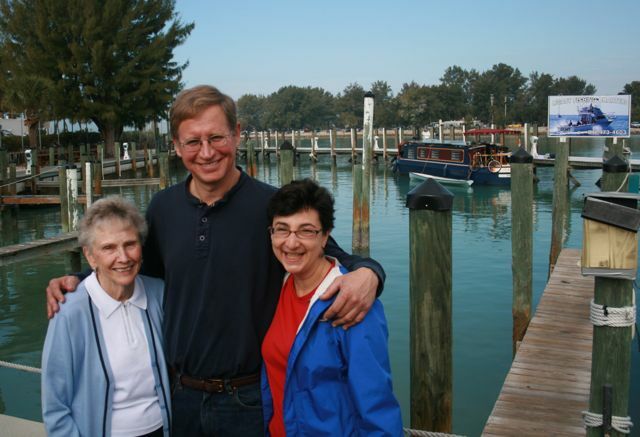 Bill is the author of The Great Dismal Atlas, a book about the Great Dismal Swamp Canal. 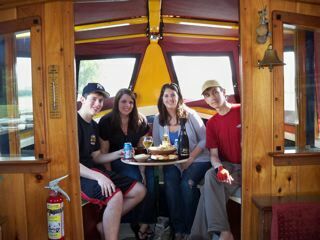 The Brotherhood of Boaters has been good to us. 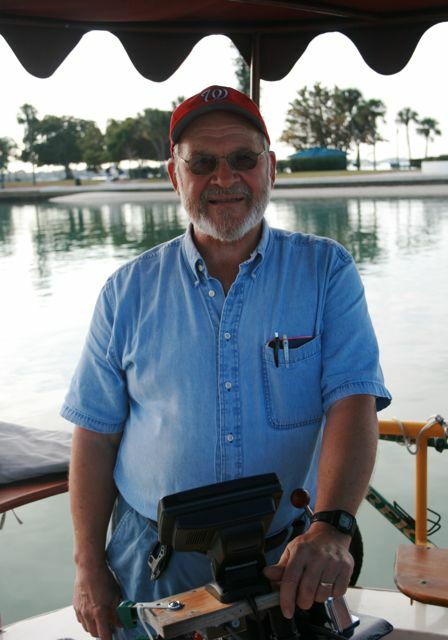 Al Miles is a Great Loop "Harbor Host" who helps visiting boaters with navigation and such. Besides poring over charts with Cap, he drove us to a grocery store for re-provisioning! Thanks, Al! This is Marilynne Stout, a figure skater extraodinaire and a dear friend from State College who spends part of the winter in Charleston. Lucky for us! This photogenic crew is the O'Connor family, who visited us in Charleston. 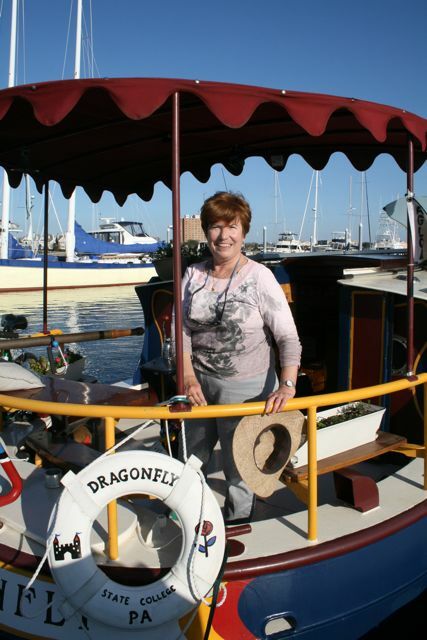 Julie is the Captain's cousin and an expert on historic restorations; she and her husband Stephen also operate a brace of very successful Irish Pubs. To top things off they have four extremely adorable children! We docked at the Lobster Shanty in Vero Beach (providing a great diversion for a busload of tourists) in order to meet Carter and Diane Quillen, who are themselves designing a solar-powered boat. It's the logical next step, since Carter already has a solar-powered ice cream cart! Family reunion time in Stuart, Florida! Our guests were Cynthia's aunts, Marilyn Willner (in the nautical stripes, far left) and Sheila Heller (stylin' ball cap, center) are accompanied by Marilyn's special friend, Sam Seeman. Marilyn, a long-time boater, was ready to stow away on the spot. 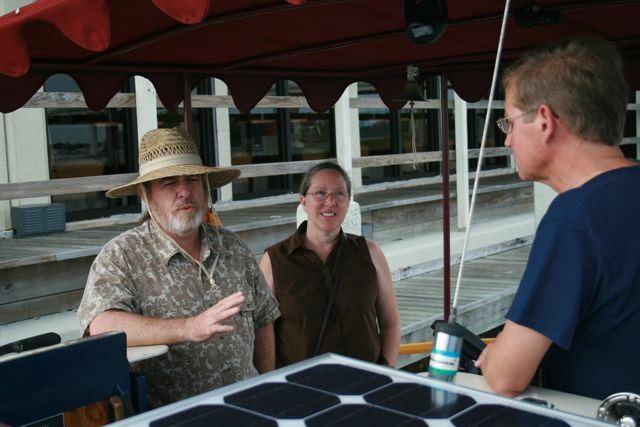 Bob and Janet Cohen, who are solar-power enthusiasts AND the parents of Cynthia's sister-in-law Val Berger, visited us in Stuart, Florida. They brought so many treats, we dined like kings for a week! Dragonfly docked at Useppa Island, where we got a warm welcome from the folks who live in this tiny but magical kingdom. Special thanks for the hospitality to (in no particular order, and we hope we didn't forget anyone) Craig and Colleen Ligibel, Jay and Ginny Taylor, Paul and Shane Swigert, Charles and Kay Chapin, and everyone who helped to make our stay so much fun. Mahala's friends (and Venetian neighbors) Clyde and Ruthie Johnson joined in the fun. They also took us on a much-needed grocery run and contributed fresh-grown limes from their garden for our future Margaritas. 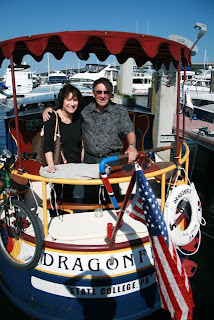 Jerry Wolfe visited us in Sarasota Harbor. Jerry is a mechanical engineer (from Ohio, originally) AND a blacksmith, so naturally he was interested to see our 14 tons of steel and our unorthodox propulsion system. 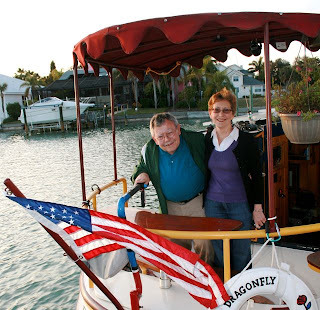 David and Kathy Reddy visited Dragonfly in Tierra Verde, Florida, and refreshed us with homemade cookies, Florida-based novels, and a trip to their favorite shrimp shak. 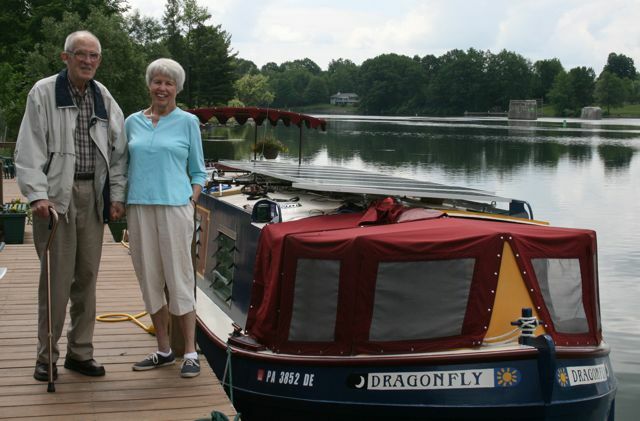 David and Kathy have had distinguished careers in their own right (anthropologist and culinary arts expert, respectively) but for Dragonfly's crew their chief claim to fame is as the parents of WPSU radio producer Emily Reddy, Cynthia's colleague. 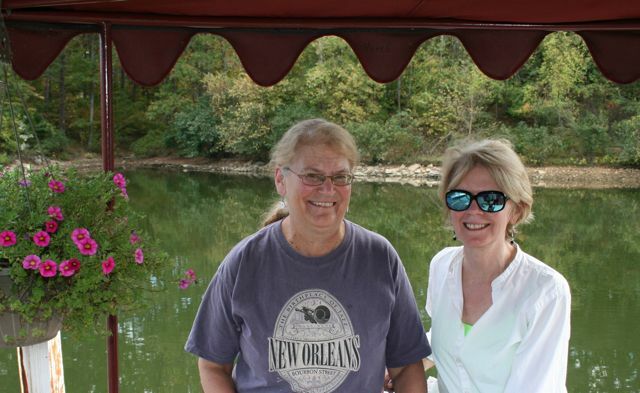 Longtime friend Marge Holland came aboard at Paris Landing, Tennessee, and brought her friend Wendy Garrison. 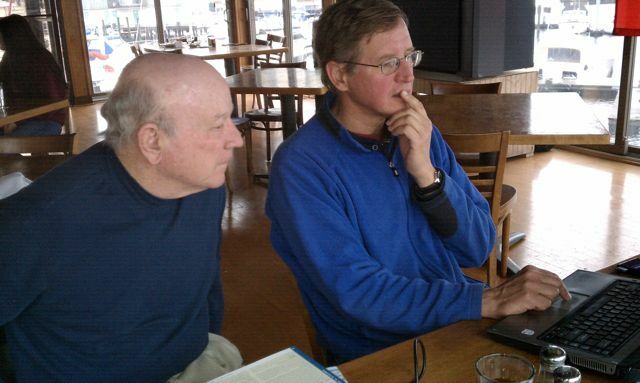 Both are botanists at the University of Mississippi. 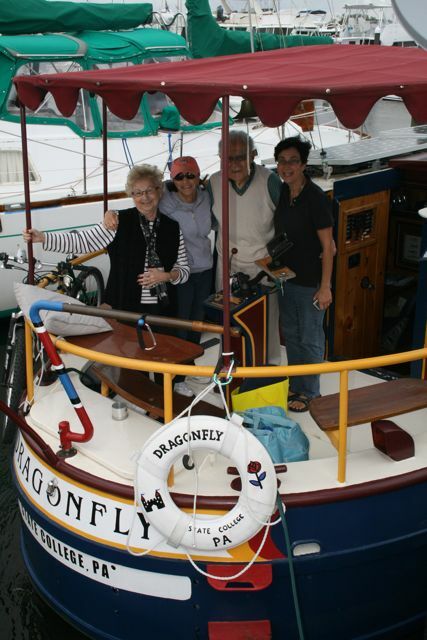 Our lunchtime cruise was highlighted by Dragonfly's first-ever live, floating concert. Dragonfly became a floating convention center as the Captain met with colleagues Steve Kerlin (director of the Center for Environmental Education at Northern Kentucky University) and Liz Goehring (education and outreach coordinator for the "Ridge 2000"project). The subject: a project that gets schoolkids worldwide involved in "citizen science." In Chicago, cousin Rick Kruger checked out Dragonfly's spacious salon, and also treated the crew to a fabulous dinner at his favorite Chicago sushi bar, where you MUST try the Green Line roll, because Rick invented it! 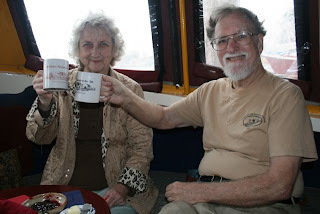 The crew's parents, Jay and Kitty Berger, had such a great time on the Mother's Day Shakedown Cruise (see May 10th, below), they came back on board for a day cruise just north of Chicago. 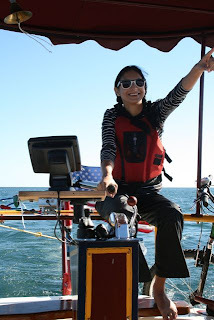 Darling Daughter cruised with us from Manitowoc to Milwaukee, demonstrating that SlowBoat can simultaneously function as a library study room and a suntanning platform . . . and that, using the contents of a tiny overnight bag, you can dress like a fashion model even while at sea. She also steered, navigated, and did manful battle with the enemy spider. 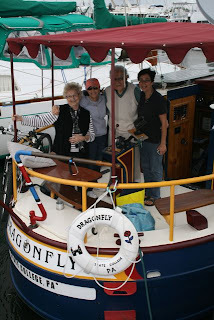 We took a shake-down cruise on Mother's Day weekend, accompanied by Jay and Kitty Berger and their friends George and Edie. The intrepid crew braved rain and wind, hail, sleet and even snow . . . and survived overnight in a haunted house! 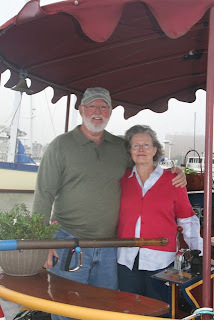 Tom and Ann Carlsen joined us in Phoenix, NY. In the mid-1800s Ann's ancestors immigrated from Ireland to a farm in Phoenix, where they raised purebred racehorses (trotters). William H. Vanderbilt bought one of the family's horses, Lysander, as you can see in this Currier and Ives print.